We have been in business almost 20 years. When you call you will talk to myself, Scott Bachman. I am here to answer all of your questions by phone or in person. Any company can tell you how much mulch you need. I can do that as well as offer advice on best product for your landscape as well as how to promote proper plant health. From weekly lawn maintenance to full landscape renovations we do it all. The heat has arrived and with little to no rain with it. Your lawn needs water but just as important it needs a slow release fertilizer. Call today for your free estimate for fertilizing. A guideline I like to go by is 1" of watering per week for lawns. Early morning is always best. Set a pie tin with a rock in it before watering. Water an area for an hour and measure how deep it is in the pan. 1/2 " or slightly more every 3-4 days is perfect with a fertilized lawn. Water to little - it will not be as effective and not reach the roots. Water too often and your lawns roots will start to grow shallow because all of the moisture is at the surface. If you want to work on your beds we offer several varieties of mulch for pick up by appointment or delivery. It is also that time to trim your shrubs and yes....we can do that as well. Something else you receive by using us.....EXPIERENCE. Here are some of the quality services offered. As shown above all mulch is separate from other varieties and stored on pavement not decomposed mulch. This will provide clean quality product every time. We will begin receiving our 2012 product after April 1st. This means fresh product - not product that has been sitting over the winter. Trucks are cleaned out before loading different colors. Free delivery on loads of 8 or more yards within 15 minutes of our shop. Larger discounts for 12 or more yards. Prices do not include sales tax. There are NO FUEL SURCHARGES. Installation available. DOUBLE PROCESSED SHREDDED OAK This is the most common type that is seen in landscape. The shred is slightly finer than a typical hardwood. From experience I feel this product retains moisture the best for plants and holds down weeds better than any other type of mulch. After application the mulch will form a bond or weave to achieve this. The weave also helps hold it in place on slopes. Price $27 per yard. Next season we will be carrying additional varieties. These are the most popular three. Anyone can have a pile of mulch to sell. 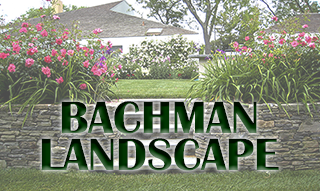 What you get with Bachman Landscape is expertise and advice on how to do the job right. I want every load of mulch to be as clean as when it was delivered. Next season our pavement will be expanded and our supplies will be larger. HOW COME YOUR PRICES ARE SO LOW? 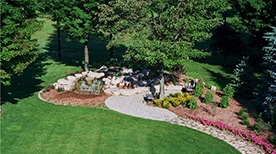 Because we are a full service landscape company our sales are spread out over the entire year. This allows us to operate at a lower markup on the mulch. HOW MUCH MULCH DO I NEED? Take the length times the width of each bed. Don't worry about the contours - just get it close. Add up all of your beds and give us a call. We know the importance of safe conditions for employees as well as customers. Lots and walks are opened prior to cars arriving and maintained clear during continued snowstorms. All equipment is newer and well maintained. Most of our trucks have "V" style plow blade's. 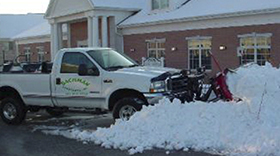 This allows us to stack snow higher and farther than traditional straight blades resulting in fewer lost parking spots. When plowing in aisles snow can be cupped and pushed towards the ends. This prevents piles of snow trailing off behind vehicles. 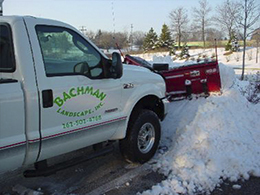 Our fleet of plow trucks will have your business open on time - every time.